Watching pirated video commonplace, but is it on the rise? New data from Irdeto says that though most understand watching pirated video is illegal, many still do it. Other data suggests video piracy may be on the decline. So, is piracy a problem for the industry or not? YouGov, on behalf of Irdeto, consulted 1,190 US adults in an online survey between Dec 29th 2016 and January 3rd 2017. The objective was to assess consumer attitudes to, and participation in, the illegal content economy. When asked if they think producing/ sharing pirated video content is or is not illegal in the USA, 74% of the survey group said it is illegal. Further, 69% think that streaming/ downloading pirated video content is illegal. Notwithstanding such high understanding of the illegality of the practice, 32% still say that they engage in it. This statistic sounds bad, however YouGov does not say how frequently people watch illegal content. It could be that the majority only stream or download from an illegal site every few months, or even less. One thing is clear from the data: when a consumer wants to see a piece of content badly enough, they are willing to bend the rules a little to get it. The survey explained to respondents that piracy has a direct negative effect on the quality of video produced. 39% said that knowing this has no effect on the amount of pirated video content they want to watch. Only 19% said it makes them want to stop watching all pirated video content. This data suggests that educating consumers on the harm piracy causes will only have a minor effect on the amount of illegal viewing they engage in. A better strategy is to compliment education with content protection, and the threat of detection and punishment. The Irdeto data doesn’t tell us how much piracy is really happening. It also doesn’t tell us it is on the increase, or decrease. However, we can consult other sources to get an idea. 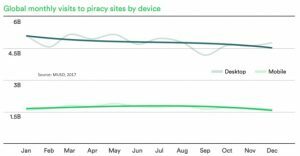 Sandvine data suggests piracy could be on the decline. The company says that aggregate bandwidth consumed by torrent traffic in 2016 during peak times was 2.85%. Netflix consumed 33% and YouTube 17%. However, torrent traffic has declined dramatically from 2008, when it consumed 31% of peak traffic. In 2015, it occupied 4.4% of aggregate peak traffic. Pirates are moving away from downloads, and towards ad-supported streaming sites. MUSO, a content protection technology company, says it tracked 78.5B movie and television piracy site visits in 2016. Of those, 74% of visits were to illegal streaming sites and 17.2% to torrent sites. The US was responsible for 12% of all illegal site visits tracked. MUSO also says that the PC remains the most popular device to use for illegal viewing. 72% of illegal site visits came from PCs, with the bulk of the remainder coming from mobile devices. Further, PC illegal accesses declined over the year, falling from 5B a month in January 2016, to 4.6B in December. Mobile downloads remained almost unchanged at 1.7B a month. Most consumers understand that consuming pirated content is illegal. However, nearly a third still do it. Other data suggests as much as a sixth of peak bandwidth usage could be absorbed by illegal streaming and torrent traffic. *There are many assumption in this number. For example, my rough calculation assumes 100% of torrent traffic comes from illegal video activity. This is not true, though illegal video downloads likely account for a large proportion of it. Therefore, readers are advised to treat the one-sixth number as rough guidance only.